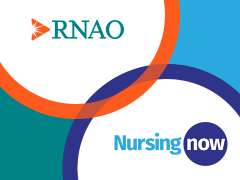 RNAO has joined the global campaign Nursing Now to improve health by raising the status of nursing worldwide. Launched last year, Nursing Now advocates that nurses share best practices, assume positions of leadership, grow their voice to shape health policy, conduct research that shows where they can have the most impact, and call upon health providers and government to invest more to grow the nursing workforce. The collaborative effort, which includes the World Health Organization and the International Council of Nurses, will focus on roles for which RNAO is a proven leader -- an advocate for better health, a vigilant promoter of the critical roles played by RNs and NPs, and a guiding light through our best practice guidelines that have been adopted by many across Canada and around the world.